More than 1,000 migrants storm border at Spain’s Ceuta (VIDEO) - The Maghreb Times ! 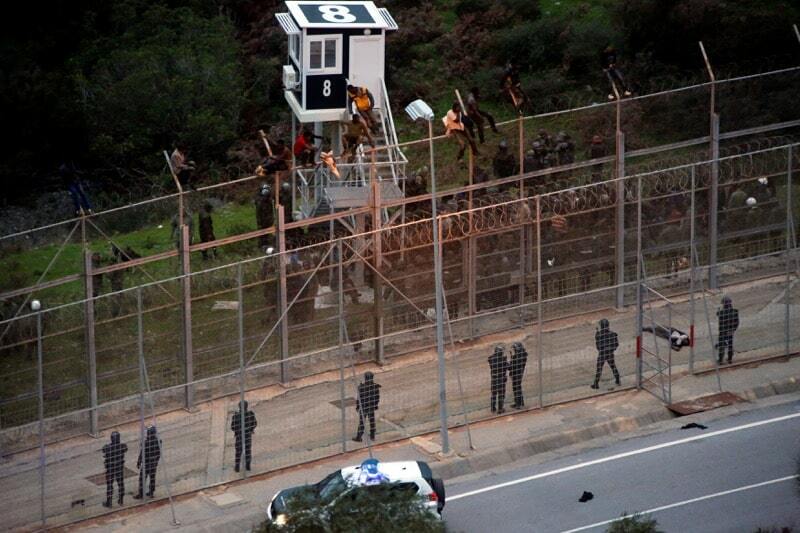 MADRID, Jan 2 — More than 1,000 migrants tried to jump a high double fence between Morocco and the Spanish enclave of Ceuta yesterday in a violent assault that saw one officer lose an eye, local authorities said. A group of 1,100 people from sub-Saharan Africa trying to reach Europe stormed the border fence just after 4am (1100 in Malaysia) on New Year’s Day in an “extremely violent and organised” way, said the central government’s representative office in Ceuta. None however managed to get through, bar two who were badly injured and taken to hospital in Ceuta, the office said in a statement. A similar assault on December 9 saw more than 400 migrants enter the tiny enclave. They tried “to force open some of the doors in the external fence, using iron bars, wire cutters and large stones with which they assaulted Moroccan forces and (Spanish) Guardia Civil (police) agents,” it added. Ceuta and Melilla, another Spanish territory in North Africa, have the European Union’s only land borders with Africa. Today, a French national was arrested for trying to board a ferry out of Ceuta with a camper van where 12 Algerians were found hiding, “car sick and sweating,” police said. According to local authorities, of the 1,100 migrants who stormed the border yesterday, just over 100 managed to climb up the external fence and stayed on top for hours.